Google Glass turns two years old today. It was April 4, 2012, when Google announced an idea that was actually called “Project Glass” at the time. Although the device still hasn’t had a wide consumer launch, much has happened to Google Glass in these two years. It’s being used in education at colleges and universities, medical schools and even veterinary schools. Police, firefighters and other emergency responders are testing Glass. There are hundreds of apps available, but only about 40 that Google has vetted and approved for inclusion in the official Glassware directory. When it comes to Glass and businesses, much of the attention has been negative. You’ve probably heard about restaurants and bars that are banning Glass, or about casinos, movie theaters and other establishments (where mobile/smartphones are also a no-no) also keeping Glass owners out. A lot of mainstream and tech media outlets love to pick up on those stories. But you probably don’t know that there are dozens of brands and businesses that have already started using Glass, or testing how they can use it. Businesses big and small are already making Glass part of how they operate. Below, our list of 60 brands and businesses that are using Glass — a list that’s certainly incomplete — and a quick snapshot of what they’re doing with it. I’ll organize these by industry. Beginning in February, Virgin Atlantic ran a six-week trial where agents at London’s Heathrow Airport used Glass to welcome the airline’s most loyal customers and process them for their flight. By using Glass, agents were able to maintain eye contact with the passenger while checking them in. The airline recently called the experiment a success, saying the check-in was more efficient than using a computer and that customers provided very positive feedback. The airline said it plans to continue testing Glass like this. Just a couple days, we wrote about this travel marketing agency that’s developing an app that will allow its hotel clients to more easily create content and share it via social networks. When a number of San Francisco establishments recently banned Google Glass wearers, this hotel took a contrarian approach by offering free drinks to Google Glass wearers. Smart marketing, too: The news earned the hotel national attention, good buzz online and the chance to host one of the biggest gatherings of Glass Explorers last Friday night. This Chicago hotel has also used Glass to try to attract patrons. It recently began offering Glass as a free, in-room amenity that any hotel guest could try out for periods of one to three hours at a time. This Fortune 500 company is trying to sell more paint via a Glass app called ColorSnap. When the user takes a photo, the app analyzes the primary colors in the photo and shows the matching colors from Sherwin-Williams lineup. This takeout restaurant chain based in Spain has developed a Google Glass app that allows customers to find and order food from the company’s vending machines. The luxury watch makers are using Glass for quality control at its 2,800 retail stores around the world. Traveling sales reps are shooting photos and videos of product displays, and that material is being used for training and customer service purposes. Kenneth Cole recently developed an entire marketing campaign around Google Glass. The company promoted its new “Mankind” fragrance by inviting Glass Explorers to do a daily good deed and share it on social media for a shot at winning $1,000 in gifts. Late last year, Jeep invited a few Glass Explorers — myself included — to spend a day driving the new Jeep Cherokee (but not while wearing Glass). The footage that the Explorers shot was used to create short videos highlighting the Cherokee’s technological features, and has also been used in pre-roll commercials airing on YouTube. Real estate agents in the U.S. are also using Glass to shoot property videos, and there’s even one in Australia doing it, too. Real estate search site Trulia was one of the first big brands that I recall announcing plans todevelop a Google Glass app. The concept video (below) from last summer gives a good idea of how it’ll work when the app is ready. What’s the holdup? A Trulia spokesperson told us the company is waiting for Google to release its full developers kit. Earlier this year, Women’s Wear Daily used Glass to report from New York Fashion Week. In February, this Raleigh-area TV station used Glass on-air for a week, giving viewers a different look at how its broadcasts are produced. This Norfolk, Virginia, station is going to do a similar experiment next week (April 7-11). Andrew Abramson, a beat writer covering the Miami Dolphins, used Glass as part of his daily reporting duties … sometimes to the chagrin of team coaches and members. Sportscaster John Kucko used Google Glass while covering this year’s Super Bowl. Last summer, producer Frank Thorp used Glass while covering news on Capitol Hill. The Kings are the first NBA team to offer fans an in-game Glass experience. Players don’t wear Glass during the game, but they have worn it during pre-game warmups. Other members of the organization, like the cheer team and the PA announcer, also wear Glass during games, and the live video stream from Glass is shown on the video screen inside the Kings home arena. After the Kings, the Pacers followed suit last week with a similar home game experienceinvolving Google Glass. The Pacers will use Glass like this at all home games for the rest of the season. Next Wednesday, the Magic will become the third NBA team to use Glass as part of the fan experience at home games. The NHL’s Capitals have also made Glass part of their home games, but with a different twist. They’ve used an app that lets Glass wearers at the arena watch replays, get up-to-the-minute game stats and more. Dave Kaval, president of the San Jose Earthquakes, is a regular Google Glass wearer and lets fans into the experience of running an MLS team by regularly tweeting Glass content via his@QuakesPrez account. In January, he used Glass and Twitter to lets fans experience the MLS Draft through his eyes. The AFL is developing a Glass app that will allow fans to hear live game commentary and see scores and stats while they’re at the stadium. Last summer, this sub shop chain started using Glass to create first-person training videos for new employees. At first, the videos focused on how to make the sandwiches correctly, then Capriotti’s expanded into videos about using the point-of-sale system and customer service. This hair care company recently hosted a Google Glass class for stylists, training them on the company’s hair care system and products. Similarly, L’Oreal Matrix has used Google Glass for a series of online hair care tutorials called Matrix Class for Glass. The tutorials use video shot from the stylists’ perspective. The industrial giant has its own Google Glass and is looking at ways to improve interaction with its equipment — with training being high on the priority list. Indiana Technology and Manufacturing Companies is using its own Glass app called MTConnect for both training on heavy machinery, as well as giving manufacturers status updates on machine operations. In January, the Kansas City Symphony partnered with a local mobile development agency to bring music fans a unique view of a symphony performance. Three musicians and music director Michael Stern wore Glass and recorded the performance from their own perspectives. Here’s video of them doing Beethoven’s Fifth Symphony. Cynthia J. Turner is also a conductor and has led the Syracuse Society for New Music while wearing Glass, as well as the Cornell University Winds ensemble. Nowsu, a co-founder of AppCurious, is also a music artist and is believed to have made thefirst music video shot completely with Google Glass. This video game maker recently released a Glass game called “Global Food Fight.” The game is free, but it serves mostly as a marketing tool for the company’s Callisto gaming platform — something Mind Pirate sells to other game makers to use in their own game apps. This company recently announced that its mobile customer relationship management client is compatible with Google Glass, opening the door for its clients to use Glass for sales, customer service and more. Last summer, the company demoed a Salesforce and Google Glass integration that sends data from the former to the latter. Sadly, we’re not aware of how far Salesforce got with this project. These companies recently showed how Google Glass could be part of the “connected home” and essentially serve as both remote control and interactive video screen for watching TV. Boston’s Beth Israel Deaconess Medical Center has customized Google Glass for emergency room use. Rather than looking up patient history on a computer, doctors are able to use Glass to scan a QR code outside the patient’s room and get instant access to important health information. Rhode Island Hospital is also using a customized version of Glass to provide dermatology consultations. With a patient’s permission, doctors use Glass to stream video of the consultation to off-site dermatologists for assistance. This wound care company is similarly using Glass across its wound centers to help patients be seen as quickly as possible by the appropriate medical expert. A company called Small World partnered with the Australian Breastfeeding Association to give Glass to 10 new mothers so that counselors could see through the moms’ eyes while they breastfed their newborn and offer any needed help. The hospital just partnered with the Houston Zoo to give young patients an up-close zoo experience that they may not have been able to enjoy any other way. Fidelity has a Glass app that sends users basic stock market results shortly after the trading day ends. Last year, Wells Fargo began testing a Google Glass app for mobile banking. This New Zealand-based bank also plans to offer mobile banking services via Google Glass whenever the device becomes available in that country. The credit card company recently launched a very basic Glass app for its customers. This Spanish bank has a very basic Glass app that offers a currency converter and a tool for finding bank branch locations. Users of the Wallaby Wallet service can use the company’s payment recommendations app to get help deciding what credit card to use in order to earn the most bonus/reward points. Intuit has adapted its GoPayment App for Google Glass. Likewise, RedBottle introduced its own GlassPay purchasing app for Google Glass last year — an app that uses the Bitcoin currency for payments. Mercedes has been working on a door-to-door navigation system that uses Google Glass. The idea is that you use the car’s navigation system while driving, but Glass takes over when you get out of the car and begin walking to your final destination. The American automaker has been kinda quiet about its plans, but has confirmed that it’s looking at Google Glass and other wearable technologies. There may be more, but here’s one local car dealership that’s been using Google Glass as a sales tool. One sales rep has made several videos via Glass introducing people to the dealership, doing test drives and more. This California company is outfitting its technicians with Glass so that they can lookup technical specifications and instructions without having to carry a laptop or a binder full of papers up on roofs. This HVAC company recently began offering a service in which its technicians use Google Glass while on service calls so that customers can see everything that’s being done. This TV commercial shows a bit of how the service works. This company that offers claims adjustment services recently began testing Google Glass in the field as a way to provide realtime feedback from field adjusters. This construction management software company is testing Glass integration in its software and envisioning the day when a construction manager can use Glass to virtually “walk through” construction sites around the world in a single day. This hosting company with data centers in Vancouver and Toronto is using Glass to improve communication between employees and with customers. This enterprise planning software company has used Glass to do short interviews with new employees so that its offices around the world can quickly “meet” the new guy/gal. 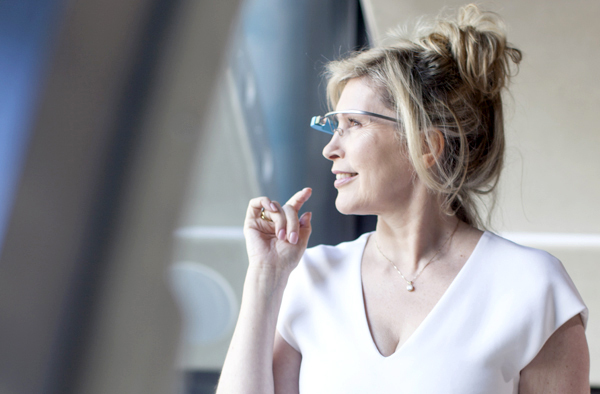 This manufacturing company has used Glass as a factory alarm service, pushing notifications to employees wearing Google Glass wherever they are. There are no doubt more examples of brands and businesses using Glass, but let’s call it good at 60, shall we? I will leave you with one more thing, however, where Glass and marketing is concerned: Just a couple weeks ago, NPR reported that Glass is coming soon to a campaign trail near you. Don’t say I didn’t warn you about that. We’ll be going through the next election cycle here in the U.S. before Glass celebrates its third birthday.